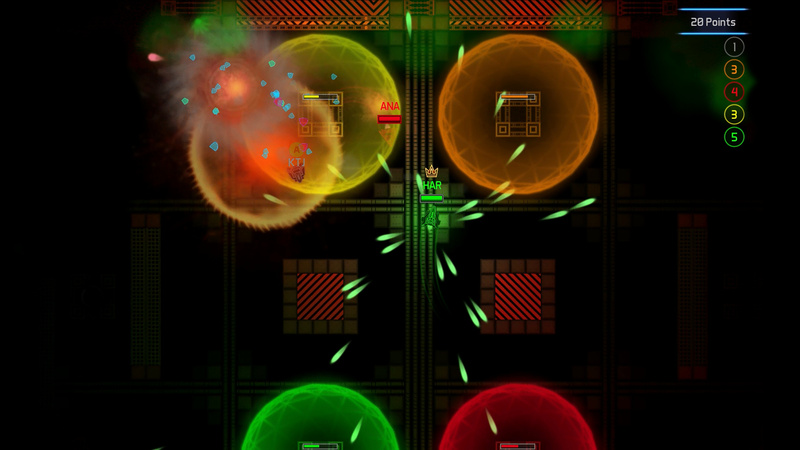 Nintendo Life: Congratulations on the upcoming launch of Aperion Cyberstorm on Nintendo Switch and Wii U. How has the transition been regarding the development process and the move to Unity? Jack Davis: Transitioning to Unity was a learning curve and finding out all the ways in which Unity operates, but was fairly painless…. So we started making the prototype in a framework called XNA, this was a very cool platform, but was phased out by Microsoft and support was dropped for the framework. We were always attracted to Unity mainly for its way to bring the game to popular platforms. At what point did you decide to develop the game for Switch as well as the Wii U and other platforms? We had been on the Wii U developer program for a while and we really wanted to bring the game to Switch! We went to EGX Rezzed 2017 and met with a Nintendo representative to talk about the game and to my surprise we were accepted into the Switch program! There is no difference apart from the Wii U version also supports IR sensor support so you can play with a single Wii mote in a crazy sword holding configuration and pointing at the screen. It works for a single Wii mote, but is a bit of handful so decided it wouldn’t work for the Switch. Does the Switch version utilise the new hardware's features? We do have a useful feature which is when you are in the character selection screens it displays what controls you have at the bottom and also the colour of these controls. We found it super useful for figuring out quickly which player is which. You can also jiggle the controller and the icon moves in case you had all grey controls. We have allowed for single and dual Joy-Cons to be used as controls schemes, and have got different levels of vibration for feedback on different effects in game. Was it important to the team to continue with the Wii U development and ultimately release it? We wanted to keep the Wii U version as it was finished and does work well on the console, and might be one of the last games on the console potentially which is a strange thing to think about. Your Twitter post was a cool acknowledgement of Nintendo's new product line. What do you think of Nintendo's difference in approach from the Wii U to the Switch and beyond? *Laughs* Thank you! When we saw the presentation I just wanted the house Labo! I think Nintendo have achieved the new breed of console that is both portable and a home console. Once people have seen a Nintendo Switch and you do the magic trick of pulling it out of the dock it all makes sense! I also love that I can take my Switch with me and take it to a friends house and place it in the dock and off we go, it reminds me of taking my memory cards to friends houses after school! 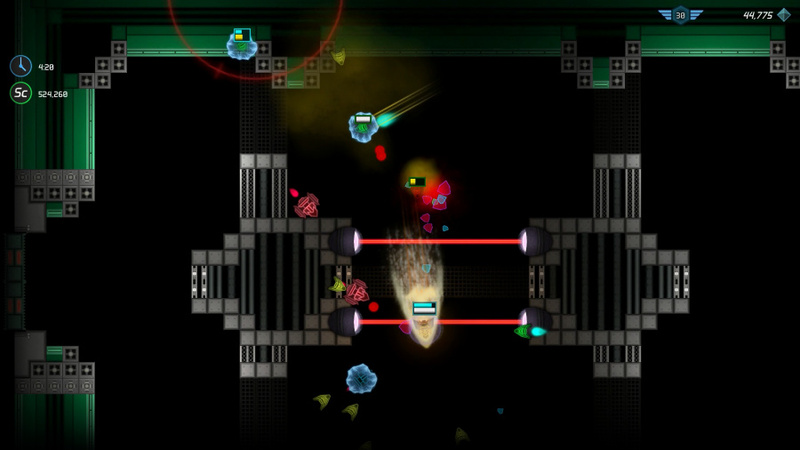 This is our studios first proper game, we have made other prototypes and GameJam games but nothing to this size! When and how did the team come together? So we all went to University (University of the West of England - UWE) together and met properly in our third year studying on the Games technology course, when we were grouped together for projects. It really worked and we all had different strengths which helped make the team solid. We have worked as a team for the last four years since and have been creating the game whilst working on smaller freelance games in-between, so it’s nice to have our own product coming out now! The name of the game is 'exotically sci-fi'...! Where does it come from? So the name is based from the Greek ‘Apeiron’ which means infinite and then when were throwing the name around someone misspelled it and it became ‘Aperion’ and it stuck haha! The Cyberstorm part just fitted the style of the game and the back story for the campaign also. 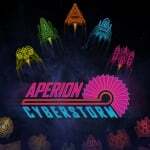 Are there any games or works in popular culture that influenced Aperion Cyberstorm's style? There are a few key ones: TowerFall was the game we would crack out at the end of the working week and battle against each other to be the last alive! It had great versus modes and allowed for custom games and all sorts of weird and wonderful outcomes same as Smash bros really. Then there's the DoDonPachi series of games, which are very traditional vertical shooters in which crazy bullet patterns and energic soundtrack and sound effects make these games arcade gold! 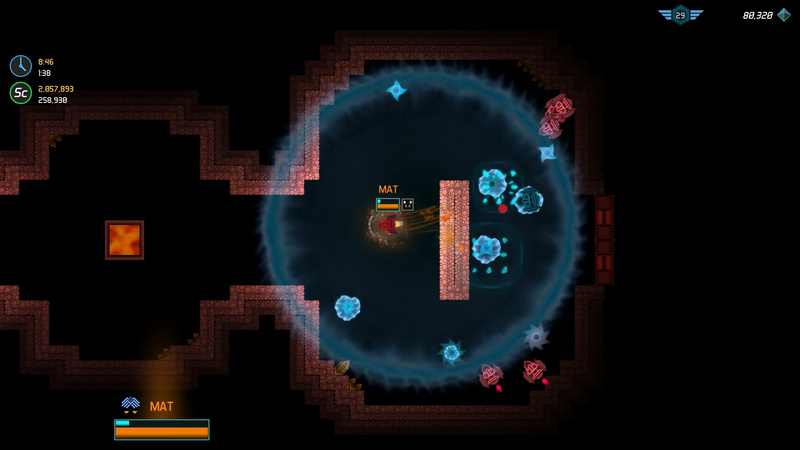 We love the craziness and style the games a lot and has been inspiration in some of the harder levels in Aperion. Whilst we were working on the game we become fans on synthwave music /soundtracks such as OGRE, Perturbator, Dance with the Dead, GOST and John Carpenter. And although our soundtrack isn’t like this it was being played whilst most of the core development took place, so it has rubbed off in places. 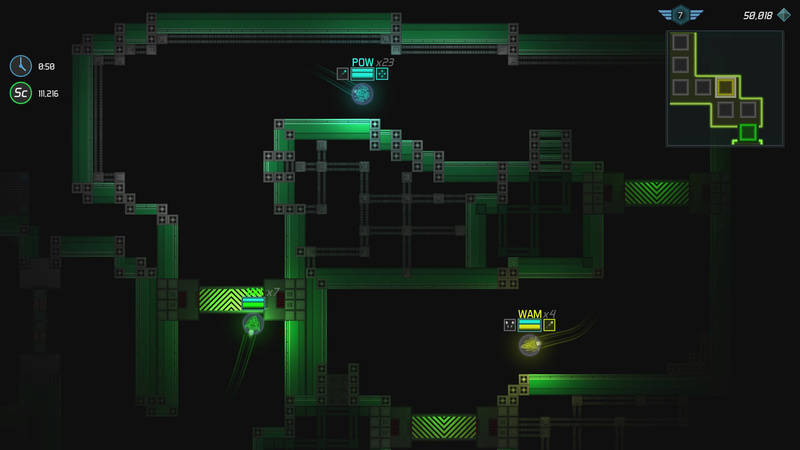 All the modes in Aperion Cyberstorm have a multiplayer component. Was this a conscious decision from the outset? Yeah, this was a huge decision at the start of development and was in the prototype version. I loved two games on GameCube – Final Fantasy Crystal Chronicles and The Legend Of Zelda: Four Swords Adventures. They both shared a bonkers setup of using GBA as controllers for the GameCube, but it was the best thing in the world when you had four friends playing together. We wanted the game to not lock players off for certain modes, so all the modes can be played solo or with up to five people. In versus you can play solo with AI to fill the places and the other modes scale up or down depending on the number of players. It was hard to balance the difficulty in campaign to work with any number of players, but we feel we have got it tuned to work well. What's the percentage/ balance between cooperative and competitive gameplay? Its probably 60% cooperative and 40% competitive, but it depends which modes you play more really. Versus has a neat modifier that allows for Team modes (so if players are same colour they are on the same team). This is really fun for having 2v2 with friends as it adds a team dynamic into the strategy. There were many different things that were planned but didn’t make it such as back tracking through levels but we found players got lost and were repeating levels which felt annoying. We have lots of abilities, versus maps and side-line story that we have in the pipeline so they may make an appearance at some point, as well as a guest appearance from fellow nindie friends of ours! What's your 'go to' mode within the team? VERSUS! It's got to be this and in Survivor mode (life based) as it creates a lot of tension when players are low on life and you have to be tactical about your engagements. 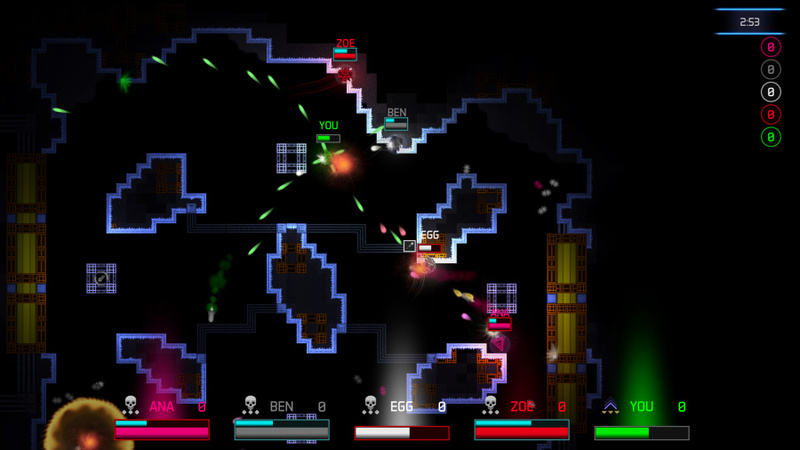 Boss rush mode is also interesting as you get to face all the bosses in sequence and can be really challenging on harder difficulties. Is there a Nintendo franchise you'd like to have a go at? Well it has to be Metroid Prime 4, being Metroid fans this is a big one for us! There are so many though. A lot of the games are local multiplayer, and this happens to be a part of the game. We wanted to create a game that when played with friends can make you sworn enemies or also best buddies. We have already had dirty play at events where players have knocked each other off stools mid game and super hyper moments of shouting, which is really funny that we have created this rage within people! But they always want to play again and redeem themselves so its all good. I’m really excited about this game and I hope other people check it out, it looks like a fantastic debut from an indie British studio! Can’t wait to play it! ...whoops, my comment seems to have disappeared into the ether. I watched the first 30 seconds, of the trailer and am already in! His is the 5th article today I've seen for a pixel game. Don't get me wrong we have some gems (slime Sam, shovel knight, dead cells). But there are SO MANY. I feel we've gone backwards in gaming. I really like his reference to the memory card era. My friends and I did that all the time. Just bringing our memory cards with us and playing games on their system with no fuss no mess. Did it a little bit with Xbox 360 hard drives too but that wasn't the same because you had to be a lot more careful with those. Bringing your Gamecube or PS2 memory card to your friend's house to play your save on their system with no extra effort is something I do miss - even I I don't miss memory cards themselves. Jesus I'm a sucker for these, i think I'm sold lol.